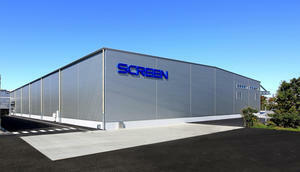 SCREEN Finishes Construction of New Manufacturing Facility for Display Production and Coating Equipment | SCREEN Holdings Co., Ltd.
Kyoto, Japan - November 16, 2018 - SCREEN Holdings Co., Ltd. has finalized construction of CS-2, its new manufacturing base specifically designed for display production and coating equipment. Work on the facility has been continuing at the site of SCREEN's existing Hikone Plant since May this year. In recent years, the display industry has seen strong growth in sales of large size LCD televisions and smartphones, particularly in the Chinese market. There has also been increasing interest in applications for high-resolution flexible displays, including technologies requiring high performance and thinness such as wearable devices and electronic paper as well as in-vehicle displays. In addition, the market for electric vehicles and other environmentally friendly vehicles is expected to continue its present level of expansion. Forecasts indicate this growth is likely to further increase demand for rechargeable batteries including lithium-ion cells. After careful consideration of these industry trends, SCREEN has constructed CS-2 to serve as a new manufacturing base. The move is intended to ensure sustainable growth of its businesses over the mid to long term. The factory will be able to supply the systems required to handle the production of ever larger displays, as well as provide the stringent levels of cleanness necessary for the manufacture of production equipment for flexible displays including increasingly precise OLED panels. It will also be able to easily supply the post-processing systems for displays managed by group company SCREEN Laminatech Co., Ltd. and the coating systems for rechargeable batteries. In March this year, SCREEN also established SCREEN FT Changshu Co., Ltd. in Changshu, China as a joint venture with local companies, and CS-2 will work closely with this Chinese base. Together, the two facilities will be able to increase production and provide an enhanced manufacturing lineup that allows the timely delivery of a wide range of equipment. SCREEN expects the construction of its new CS-2 manufacturing base to further increase its share of the display production equipment market. The plan will also help to strengthen its profitability and competitiveness in this market and the coating equipment field. The CS name comes from the initial letters of crystal square. It also embodies SCREEN's hope that the factory will continue to supply products that deliver outstanding "customer satisfaction."